Disclosure: I received something of value from Ford Field. No other compensation was given. Read our full disclosure policy here. You can buy tickets on the Ford Field website, Kenny Chesney website, Live Nation, Ticketmaster, and more. VIP & Travel packages are available HERE. VIP includes options for early admission to The Sandbar, access to an exclusive, elevated viewing platform (above soundboard, with the best view and sound in the house - in the center of it all! ), an acoustic guitar signed by Kenny Chesney, invitation to the exclusive VIP pre-show party, parking pass, limited edition merchandise, and so much more. Travel Packages include premium reserved or VIP tickets, hotel accommodations, deluxe motor coach transportation to and from the venue, and more. I've always been a country music fan. My husband is not. However, we both enjoyed the awesome Kenny Chesney & Eric Church concert at Ford Field in 2013. Now my husband is an Eric Church fan, too. I am excited to go see both singers again next year. It's a fun atmosphere, being with a crowd of cheering, screaming, and dancing fans. Here are some photos I took at the last show. 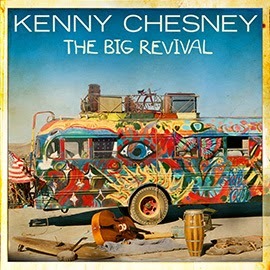 "Some of the most fun I've ever had on tour was last summer with Kenny," Church stated via Rolling Stone. "He's an artist that isn't afraid to let you come full blast and do what you do. It's rare you get to tour with someone you respect and you are friends with. I can't wait to do it again." An Eric Church concert just wouldn't be complete without the signature aviator sunglasses and trucker hat that have become staples of the Nashville-based country rocker's live show. Influenced by a spectrum of artists ranging from Merle Haggard to Metallica, Church serves up his rock and roll-infused country tracks with an infectious energy and sly grin that have landed him on tour with some of the biggest names in country music. Brantley Gilbert is the country rock singing sensation fans rush to see in concert. His super-packed shows over the past several years feature authentic, toe-tapping melodies and haunting lyrics, pleasing both die-hard country fans and rock music lovers. His latest single, More Than Miles, combines strong beats with country-style lyrics for a unique sound. Brantley’s concerts, much like his lyrics, provide audience members with a sense of authenticity, heartfelt lyrics and beats you can dance to. Chase Rice broke through the scene in 2010 with the group Florida Georgia Line before self-recording and releasing the EP,Country as Me, in 2011. A full-length album, Dirt Road Communion, followed in 2012, featuring the hit single “How She Rolls.” Rice's relentless touring has earned him an impressive following of country music fans. What is your favorite song from any of the artists that are going to be at the concert? 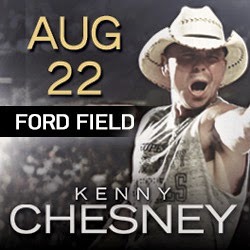 Mom Among Chaos is giving away a pair of tickets to see the Kenny Chesney concert on Saturday, August 22nd 2015 at 5:00pm at Ford Field in Detroit, MI. Enter to win in the form below. 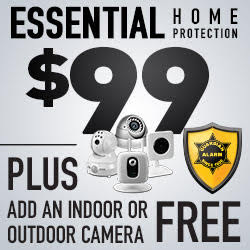 Ends 1/5/2015.